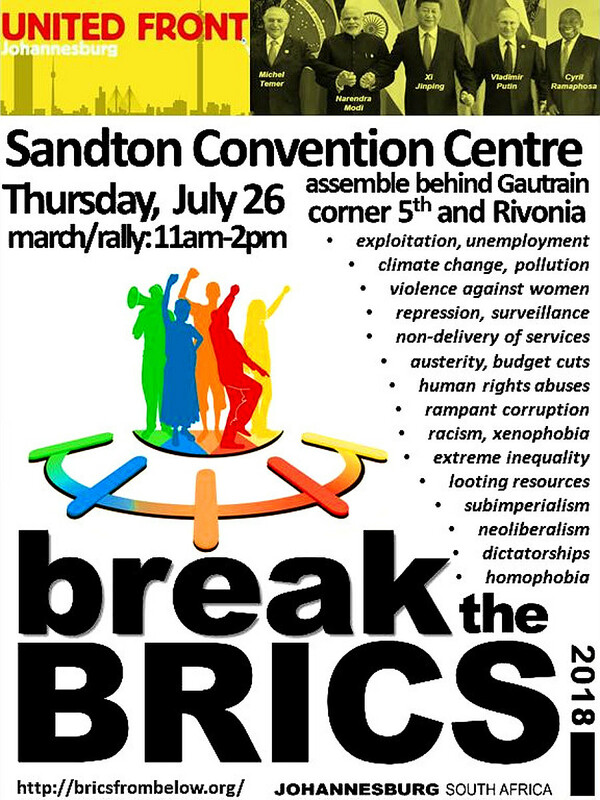 On Thursday 26 July 2018 different formations calling themselves "Break the BRICS Coalition" marched to the Sandton Convention Centre the venue of the 10th BRICS Summit. 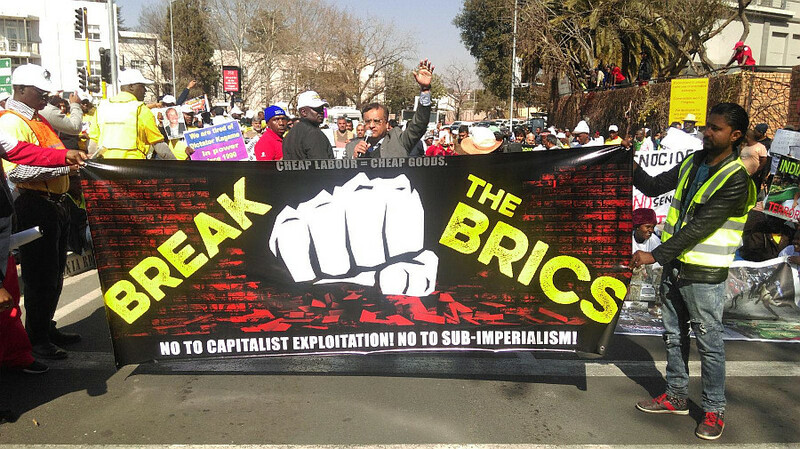 The march was a protest against what the coalition calls the capitalist nature of the BRICS states, their anti-working class behaviour, and their environmentally destructive policies. Its intention was to put forward their demands for world to see. Together as a bloc, the five BRICS countries – Brazil, Russia, India, China and South Africa – control a quarter of the earth’s land mass but 42% of its population. The BRICS are relatively inward-looking economies; although they host 46% of the global workforce, they are responsible for just 14% of world trade and 19% of world Gross Domestic Product (although this rises to 27% if measured in purchasing power parity terms – in which per capita GDP is also low, with only Russia enjoying an income higher than the world average of ($11,800). There is extensive ceremonial pageantry and back-slapping at these events, although they usually last just two days. Parallel conferences of business leaders typically have access to the state officials, unlike other official civil society BRICS events, which are kept on the sidelines and are usually held weeks before. 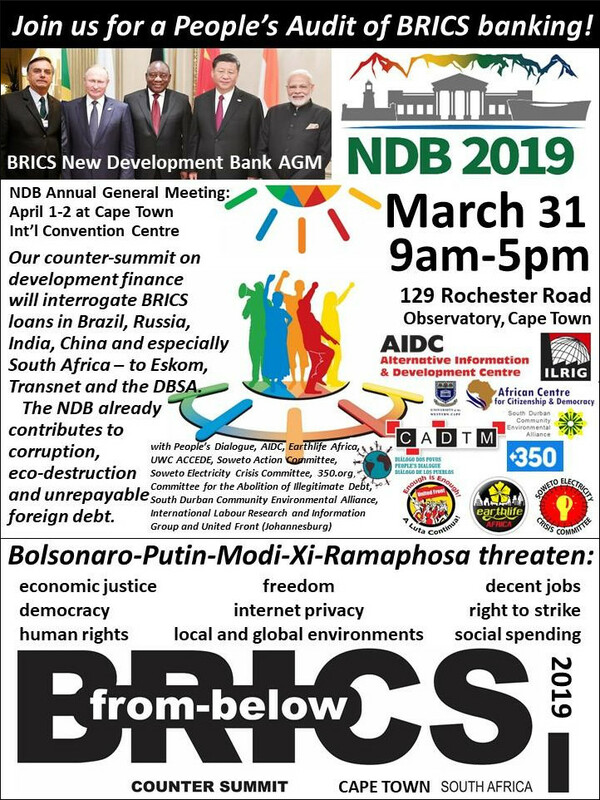 Beyond state and business summitry, there have also been regular meetings of BRICS trade unions, since Moscow in 2012, but in the form of a parallel summit starting with Durban in 2013. The ‘Civil BRICS’ of civil society groups began meeting in Moscow in 2015, sponsored by the Putin regime (along with Oxfam) and hence carrying so little credibility that the main Brazilian development network (Rebrip) formally boycotted the inaugural Civil BRICS. Dozens of other BRICS-related events occur in between on different schedules, including meetings of ministers responsible for economies, security, agriculture, health and municipal government, as well as think tanks and interested academics. These have had a degree of official support, in large part because they generally refrain from offering tough criticism. As a result, the ‘academic’ analysis is causing substantial controversy in South Africa, as shown below. BRICS Think Tank chairperson, Ari Sitas, adds to the world-shaping narrative a series of admirable scholarly and professional projects to improve BRICS societies. But how much of Sitas’ narrative is a pipe-dream? And in view of mounting evidence of intellectual weaknesses, how much can a think tank leader even as sharp as Sitas avoid the accusation that his institution is reduced to the classic scam: people paid to think by the people who control the tanks? A critique of the 2018 BRICS Think Tank and Academic Forum conference is offered in the 2018 BRICS Politricks reader, as well as a more nuanced rejoinder by an activist (Bandile Mdlalose) and a scholar (Lisa Thompson) working on the inside to improve these two institutions. The proper model for this is to have a “tree shaker” and a “jam maker” division of labour. But in spite of tree-shaker efforts, this approach has not yet been arrived at by either the insiders or outsiders. 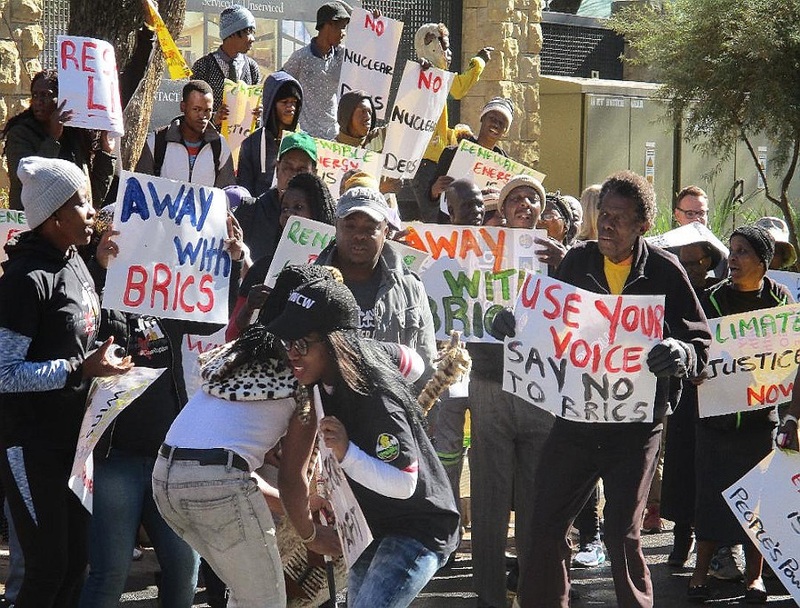 As a symbolic exercise in civil society engagement, a “Civil BRICS” meeting was held in June. It was tightly controlled by Chinese authorities, however, and the concluding declaration was pre-drafted before the meeting even took place. 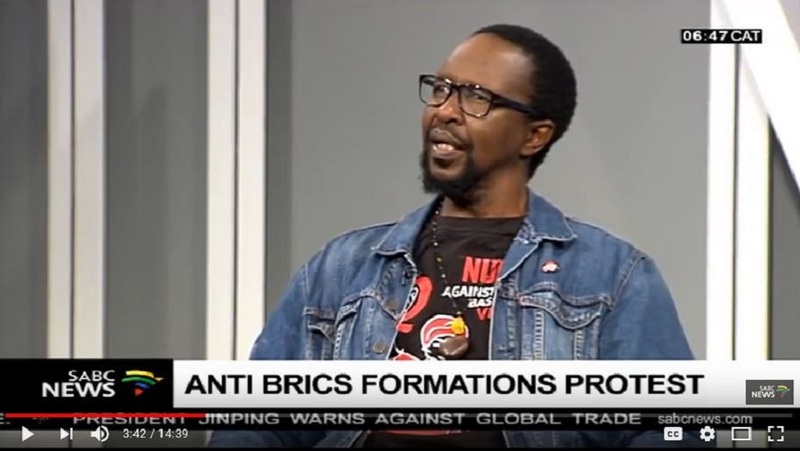 The Civil BRICS’ problem is also evident within BRICS Youth, as argued by Njabulo Maphumulo and Lynford Dor, as well as in the BRICS Trade Union Forum. 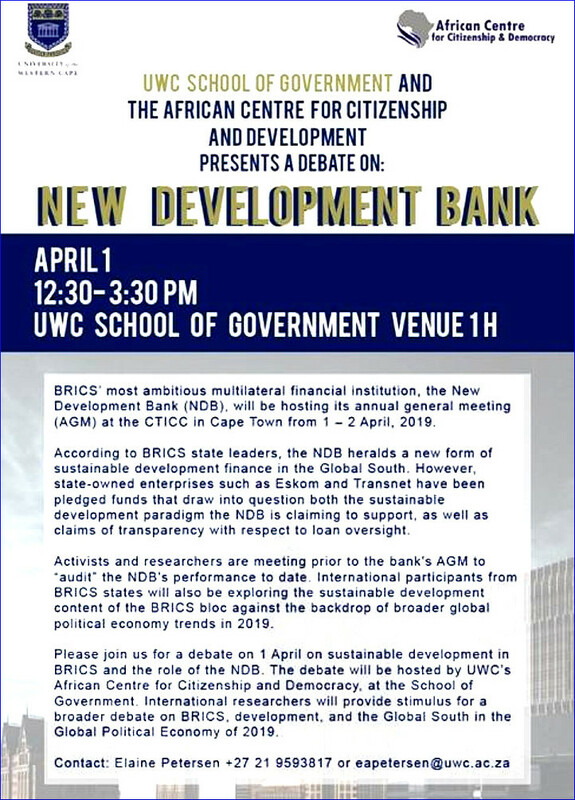 One central test of whether the BRICS offer anything different, and whether civil society reformers can open up ‘engagement’ opportunities, is the BRICS New Development Bank. The use of Public – Private Partnerships as an important instrument for the bank to leverage resources of private sector and increase its participation in major infrastructure. Moreover, according to African Monitor and Oxfam, “civil society appreciates the work and progress that the NDB has made thus far.” This may have been true for civilised society but for the large group of civil society watchdogs of the BRICS bank, the institution was practically impossible to work with, repeatedly failing the most basic tests of communication, transparency and consultation. 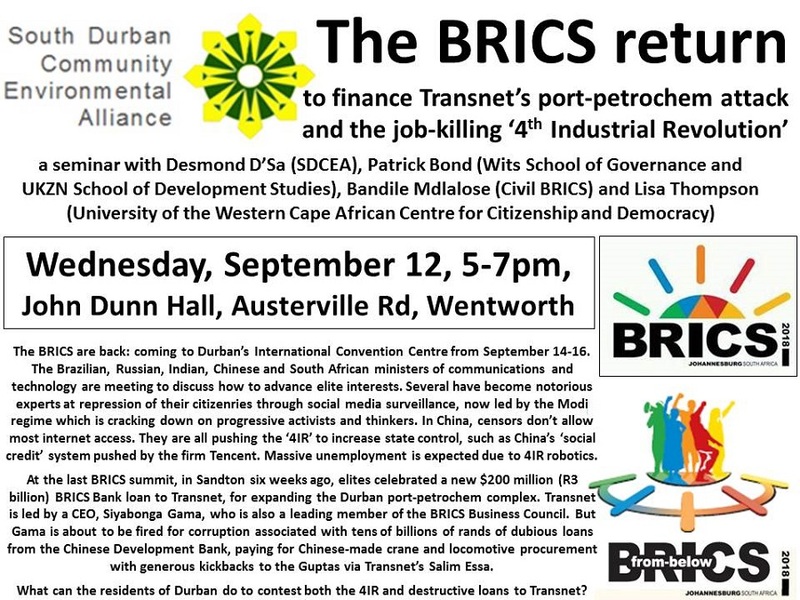 There are much less civil critics in relation to the BRICS Bank, including those in South Durban (such as community leader Desmond D’Sa) who are disgusted with the bankers’ lending criteria and unwillingness to engage local critics, even when widespread debtor corruption appears to run rampant. The South Durban case – in which the parastatal Transnet is attempting to raise funding for expansion of Durban’s controversial port-petrochemical complex – is illustrative, given long-standing eco-social protests against Transnet. But there is an even greater concern about the BRICS positioning in global circuits. The cases of finance, trade and climate negotiations are discussed below in detail. Geopolitical processes are also revealing. Vijay Prashad observes “BRICS in the ruins of the present.”	A major problem is the ongoing failure of the BRICS ‘centripetal’ strategy of capital accumulation. Add to this regional repression, e.g. the way Modi’s colonial-style control of Kashmir is unfolding, with crimes so severe that the UN Commission for Human Rights issued another report in June 2018 condemning India. Even South Africa’s moribund National Prosecuting Authority began investigating Modi’s role prior to his BRICS visit, as noted in reports below by the Voice of the Cape and Iqbal Jassat. In reality, notwithstanding the occasional bursts of anti-imperialist rhetoric from some pro-BRICS politicians and analysts, these are sites where ‘subimperial’ politics are on display. The term comes from a Brazilian political economist, Ruy Mauro Marini (1932-97), and will be referred to periodically, below, where it is useful to indicate overlapping interests of Western and BRICS powers, or ways that BRICS firms penetrate their societies and hinterlands in a manner comparable to Western Multinational Corporations. •	In Johannesburg, in addition to select African heads of state, five major guests are regional leaders who are also heads of state of: Egypt (as Chair of the G77+China), Argentina (Chair of the G20 and a MERCOSUR member), Indonesia (Co-Chair with SA of the New Africa-Asia Strategic Partnership and an ASEAN member), Jamaica (incoming Chair of CARICOM), and Turkey (as Chair of the OIC). •	In Xiamen, the BRICS-Plus group was initiated to include Egypt, Guinea, Mexico, Tajikistan and Thailand. •	In Goa, notably, regional collaboration did not include Pakistan, but did include India’s Bay of Bengal Initiative for Multi-Sectoral Technical and Economic Cooperation neighbours: Bangladesh, Myanmar, Sri Lanka, Thailand, Bhutan and Nepal. •	In Ufa, the BRICS overlapped with the Shanghai Cooperation Organisation, which includes Kazakhstan, Tajikistan, Kyrgyzstan and Uzbekistan along with the observer states Afghanistan, India, Iran, Mongolia and Pakistan. •	In Brasilia just after the Fortaleza meeting, the Brazilian hosts invited leaders from the Union of South American Nations, including Argentina, Bolivia, Chile, Colombia, Ecuador, Guyana, Paraguay, Peru, Suriname, Uruguay and Venezuela. In some cases, depending partly upon which political party is in power, such outreach is welcomed as genuine partnership; in other cases, this strategy appears to be akin to a co-optation process, in which weaker neighbours are seen mainly as the BRICS’ hinterlands. Geopolitical and material benefits accrue mostly to the strongest BRICS countries and firms. The case of IMF reform – which disempowered many BRICS neighbours by lowering their voting power (so four of the BRICS could rise, as discussed below) – makes clear this latter sub-imperial dynamic. As a bloc, BRICS issues periodic communiques and occasionally acts in concert. One example was the successful lobbying by BRICS foreign ministers against the proposed expulsion of Russia from the 2014 G20 Brisbane summit following sanctions imposed on Moscow by the West after the March 2014 transfer of power in Crimea. BRICS will ultimately be known not for its generally anti-Western rhetoric, but for what it does, concretely, to change the world. The most important innovations are institutional: the BRICS New Development Bank (NDB) for project loans and the Contingent Reserve Arrangement (CRA) for potential financial crises. The CRA stands ready to augment the IMF in the event bail-out credits are required by BRICS members. The latter two strategies appear to be largely conceptual, with a less than certain chance of coming to fruition in the near future. BRICS countries’ invasive surveillance of their citizenries is nearly as obnoxious as the US National Security Agency, and a “market-oriented” approach to a new BRICS credit ratings agency (as discussed in most such meetings) would leave such an institution operating much as do the existing agencies. Reviewing BRICS Politricks in this way, we find far more in common with the worst of the Western imperial powers: aggressive geopolitics, self-interested economics, social repression and environmental irresponsibility. 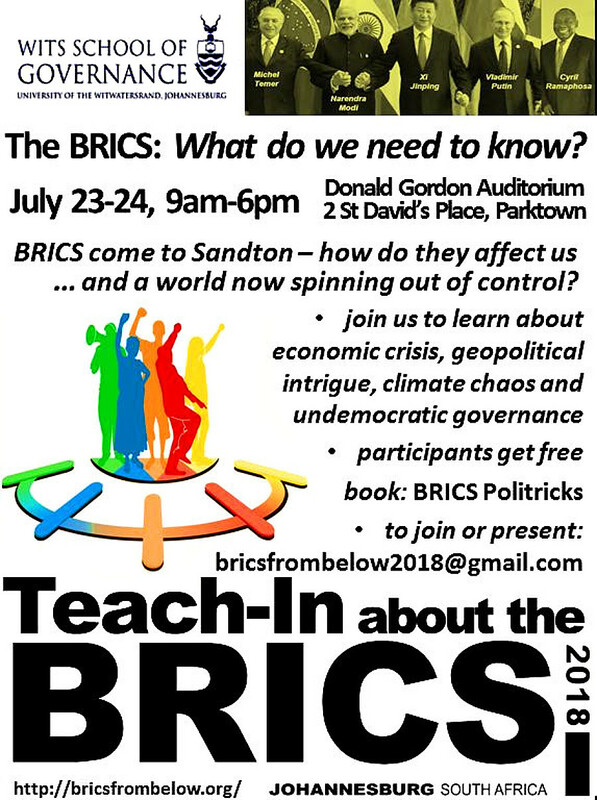 Which brings us to ask, why would BRICS-from-the-Middle scholars, NGOs and labour strategists within civilised society want to spend so much time and political capital legitimising these leaders and states? To that question, we have only the standard answer that critics of petit-bourgeois centrism have always offered: opportunism. There is another answer, too: the forces of uncivil society that meet annually to delegitimise the BRICS have not achieved powers of persuasion to change all the minds we will need to. The BRICS Summit, with Temer-Putin-Modi-Xi-Ramaphosa, joined by Erdogan-Al-Sisi-Macri-etc - begins on Wednesday. Already, brics-from-below folk are gathering. If you're in Johannesburg, join us to discuss multiple crises - political, social, economic and ecological - and society's responses at the University of the Witwatersrand School of Governance on Monday-Tuesday, 9am-6pm (2 St David's Place, Parktown). (Please RSVP to bricsfrombelow2018@gmail.com for catering purposes.) Well-known scholars, commentators, journalists and NGO experts will be with us. I can send you the final programme later today if you're interested; let me know by email. And there will be more updates soon about follow-up activism. They're back in the news here in Johannesburg, because in six weeks the BRICS heads of state and BRICS Business Council meet. 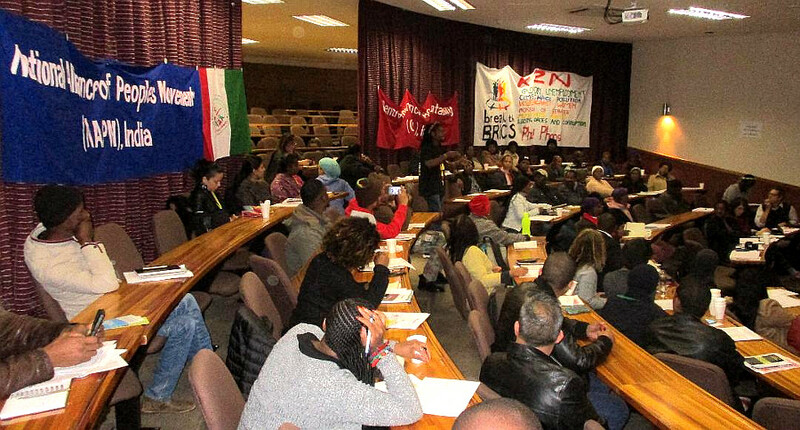 Also, several Brics-from-the-middle forces have been active: the Academic Forum last week, the Civil BRICS in a couple of weeks, the BRICS Youth now in Moscow and the BRICS Trade Union Forum later in July. This too has generated some interesting debates as you see below; next time I write, I'll send out the two statements from the intellectuals and Civil BRICS that I have. But we are in a very uncertain situation geopolitically now. The terrain now of centrifugal economics and politics is now more uneven than when I last wrote you, last August. Even in past days, Donald Trump has opened up the possibility of a wedge involving Russia, which I'd be grateful if anyone has seen good information to help interpret. In between there are a great many objections to the BRICS elites - see the draft call to action below - including very intense forms of rising social resistance. I will send more information on activist initiatives soon. 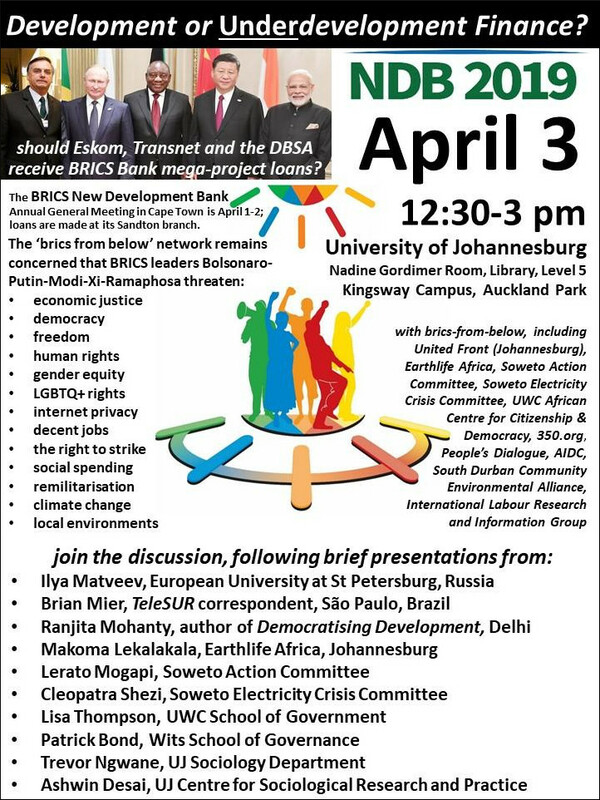 But one begins soon here in Johannesburg: a community-labour-women's-youth-environmental coalition forming, called "Break the BRICS." Below the advertisement for the strategy session, are some links to articles I've written over the past six months. I'll send out more in coming days, as we construct educational and intellectual resource packages. Across the world, trade unions are under unprecedented threat, as just witnessed in the United States in the Janus vs. AFSCME Supreme Court decision which denudes an already weak labour movement of public sector power and funds. Where, then, does organisational hope for working people lie?